Dr Paul Tierney was born in Edinburgh in 1984 but grew up in Hawick in the Scottish Borders. He graduated from the University of Aberdeen in 2006 with a first class BMus (Hons.) degree and in 2012 with a PhD in composition, also from the University of Aberdeen. He has taken part in numerous masterclasses with singers such as Donald Maxwell, Raimund Herincx, Cate Hughes, Irene Drummond, Margaret Cable and Stephen Varcoe. In 2005 he was awarded the Ellie Pirie award by Aberdeen Bach Choir and the North East of Scotland Music School. In 2006 Paul was awarded the first Derek Ogston Postgraduate Music Scholarship from the University of Aberdeen. He is also the recipient of the Nora Bentley Award for his services with the University of Aberdeen Chapel Choir. As a soloist Paul has performed with many groups including Aberdeen Choral Society, University of Aberdeen Choral Society and Chapel Choir, Concordia String Orchestra, Aberdeen Orpheus Choir, Peterhead Choral Society, Inverurie Choral Society, Roxburgh Singers and the Queens Cross Charity Concert. He has also performed with the Hereford International Summer School Chorus in the role of Aeneas in Purcell’s ‘Dido and Aeneas’. Paul has also performed with the Gustavus Adolphus New Music Ensemble in Minneapolis, USA. He also gives numerous recitals of English Song and Lieder and last year gave the first Scottish performance of ‘To a Poet’ by Gerald Finzi. He has also received rave reviews for his recent performances of ‘Die Schone Mullerin’ and ‘Winterreise’ of Schubert; “Tierney’s singing was a revelation!” Paul has recently recorded ‘Winterreise’ with Roger Williams at the piano and the CD is now available. Paul is also active as a conductor and composer and has studied with Alasdair Nicholson, Sally Beamish and Sir. Peter Maxwell Davies as part of the first St. Magnus Composers Course. His piece ‘Threnody’ was premiered by the Kreisler ensemble at the St. Magnus Festival. Paul’s music has also been performed by the Edinburgh Quartet, members of the BBC Scottish Symphony Orchestra, Gemini Ensemble and Lontano Ensemble. Paul’s work, ‘Gallowgate Lard’, based on the painting by Ken Currie was commissioned as part of the 2009 Sound Festival and was given its first performance by Roberto Fabricciani, Tadej Kenig and Rohan De Saram. Paul was also featured as principal guest composer at the Dana School of Music New Music Fetival XXVII at Youngstown State University, Ohio, USA in May 2011. In June 2011 his new percussion concerto ‘Landscape from a Dream’ was performed by the Inverurie Orchestra conducted by the composer. Paul has recently presented a paper on the influence that music of the Far East had on the creative output of Benjamin Britten at the conference ‘Britten 100: An American Music Centenary’ at Illinois State University, Bloomington, USA. Paul is currently musical director and conductor of the Inverurie Orchestra. Paul has conducted the Inverurie Orchestra since it was formed in 2007. Notable highlights have included several collaborations with Inverurie Choral Society. These collaborations have included performances of well known opera choruses, arias and overtures as well as a performance of ‘The Music Makers’ by Elgar. The Inverurie Orchestra also gave a highly successful performance of Howard Blake’s ‘The Snowman’ in December 2014. Paul also conducted a full performance of Handel’s ‘Messiah’ with the Inverurie Choral Society and chamber orchestra in March 2012. Paul was the founding director of the University of Aberdeen New Music Group and has also conducted Inverurie Choral Society, University of Aberdeen Chapel Choir, the Learig Orchestra and University of Aberdeen Gilbert and Sullivan Society. He has recently conducted performances of Maxwell Davies ‘Eight Songs for a Mad King’, Schoenberg’s ‘Pierrot Lunaire’, Varese ‘Octandre’, Handel’s ‘Messiah’ and Mendelssohn’s Third Symphony. In April 2014, Paul conducted the University of Aberdeen opera society in a series of performances of ‘Eugene Onegin’ by Tchaikovsky. In May 2016, Paul conduced Aberdeen Sinfonietta in a performance including music by Rossini, Donizetti and Haydn. Paul has recently been appointed as chorus master of Haddo House Choral and Operatic Society and took over as their musical director in April 2017. 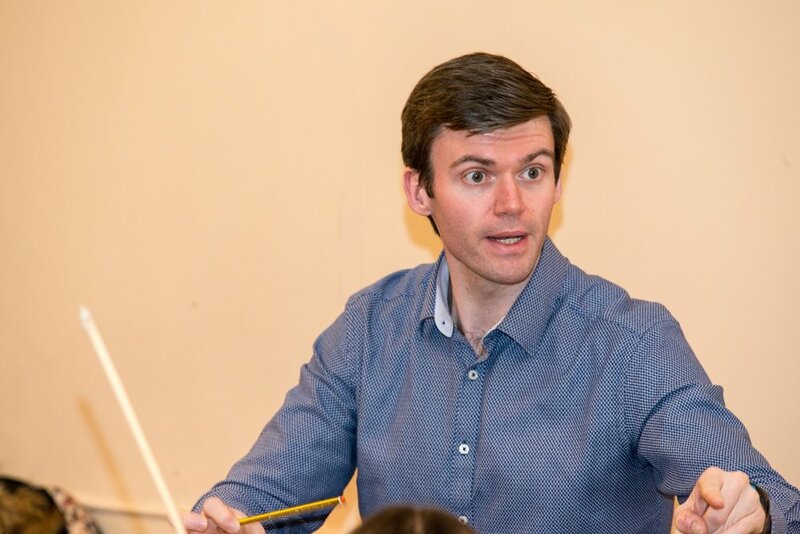 As well as working with both orchestras and choirs in a formal rehearsal and performance scenario, Paul has also led informal workshops on singing technique with local choirs as well as leading a recent come and sing day of Handel’s ‘Messiah’ at St. Machar’s Cathedral, Aberdeen.